Now a days “Get together” parties are new trend, most of the people like students,employees and others are celebrating and remembering the memories of their schooling and other memorable days during their meet.Now our south Indian stars also following the trend.Only actors allowed, no spouse or outsiders are not allowed for this party. Our south film actors also had get together party at Malayalam actor Mohanlal’s beachfront property in Injambakkam on East Coast Road, which was held on January 18th evening.The 80s popular stars were attended for this get-together party. 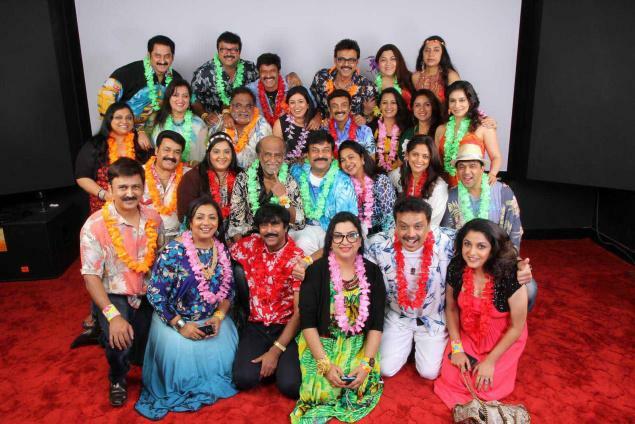 This is a fifth such get-together party of the south actors ever since Suhasini Maniratnam and Lissy Priyadarshan hosted the first get-together party in 2009. Almost 32 south popular stars including superstar Rajinikanth and Megastar Chiranjeevi, Balakrishna, Venkatesh, Mohanlal, Suman and leading ladies of 80’s like Radhika, Radha, Revathi,Ambika, Nadiya, Ramya Krishnan, Kushboo, Poornima Bhagyaraj, Lissy Priyadarshan,Suhasini and others attended for this party.Hero Mohanlal played the perfect host and even entertained them with a magic show. The theme of this party was Hawaiian Theme and all the stars who attended the party wore Hawaiian style outfits. All the actors wore the printed shirts synonymous with the islands. Portraits of all the participants were given as gifts to all the actors at the end of the party.The stars have already fixed a date for their next meet in 2015. Have a look at the picture of stars in colorful dresses! !